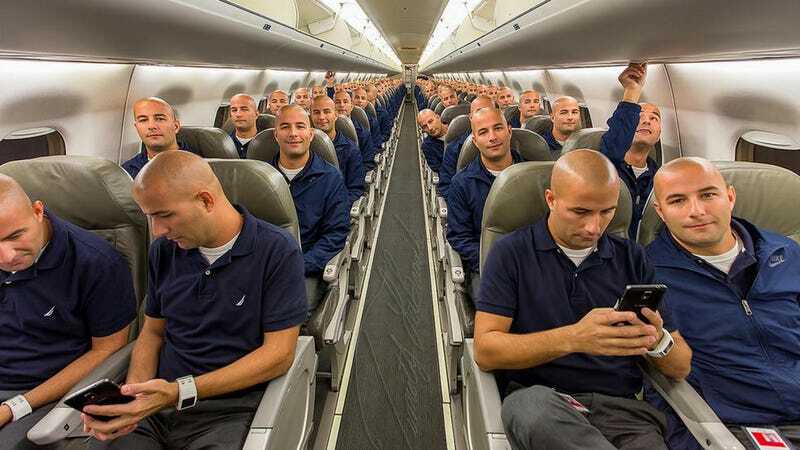 A photographer named Timothy LaBranche recently had the inside of an Embraer 190 to himself, so he did what almost any aviation lover would do. He took a photo of himself sitting in the plane. Then he took 99 more — one in every seat. Unfortunately there aren't a lot of details about how the whole thing went down, but on Tim's Flickr page it says the photo was taken on November 24th of this year, on an Embraer 190 jet. At first, I didn't recognize the interior, but then I saw the "Even More" sign with the row number, so it's definitely a jetBlue plane. "Even More" is what they call their extended legroom product. I feel like a kid around planes, especially planes that are new to me. If I had any skills at Photoshop, I'd probably do something similar if I had the opportunity. When I have a photo op for myself inside a plane, it's almost always in the left seat on the flight deck. I know it's super nerdy, but at this point, it's more like an "I was here" collection or a checklist. In the past couple of years, I've been in the captain's chairs of the Boeing 737, 747, 787, Airbus A340, A380, a few different business jets, and a 62 year-old Convair 580. What do you do to record the different types of planes you fly on, or (for the car guys in the audience) the different cars you get the chance to drive? Tell us in the comments below. Top image posted to Twitter by @UnitedFlyerHD.